On July 2nd, communications systems worldwide are sent into chaos by a strange atmospheric interference. It is soon learned by the military that a number of enormous objects are on a collision course with Earth. At first thought to be meteors, they are later revealed to be gigantic spacecraft, piloted by a mysterious alien species. 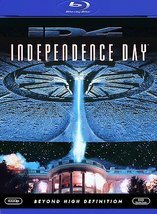 Fox Home Entertainment is expanding their 4K Ultra HD Blu-ray catalog offerings this June with the release of the recently announced ‘Independence Day: 20th Anniversary Edition’ from director Roland Emmerich and producer Dean Devlin in the new 4K home video format on June 7th.